Location: Switzerland Thanks for your additional explanation. Now I understand that your aim is to organize a WSC that is clearly about sudoku, what was not clear for me from the text written in the FAQ page. I'm sorry, but I still need a few precisions about 2 points : basic definition and hybrids between sudoku and other puzzles. "We define a sudoku as a puzzle in which numbers/characters do not repeat in a row, column or an outlined area." puzzle 1234, round 2 of WSC 2015, doesn't enter in your definition, with several numbers repeating in rows, columns and outlined area ? A single cell cannot be considered as an outlined area, as it doesn't add any constraint ? Outlined areas must cover the whole grid,(or a large majority of at least 90% of cells if you want to refer to WSC 2010 guidelines, that you'll find in the puzwiki website that is linked from all WPF website pages) ? I would like to have a few clarifications now about puzzles that are hybrid between sudoku and other puzzle types. I've the quite exact opposite opinion, and I hope the consequence will not be that I have to renounce to take part in WSC for a second year in a row. In the discussion, you take the example of the skyscrapers sudoku. In my opinion this is not an hybrid between a sudoku and a puzzle, thus all kind of skyscrapers sudoku will be fine for me at WSC. [The reason is: Sudoku can be defined (except for geometrical variations) as latin square with regions (In the strict sense: a Latin square is an n × n array filled with n different symbols, each occurring exactly once in each row and exactly once in each column. (wikipedia)). I don't know if some sudoku players consider skycrapers sudoku as a variant which need a special treatment in WSC. I don't. With these kind of puzzles I fear that manipulations of author aren't sufficiant to reduce any unfair advantage. “Apply standard sudoku rules for the digits 0 to 8. 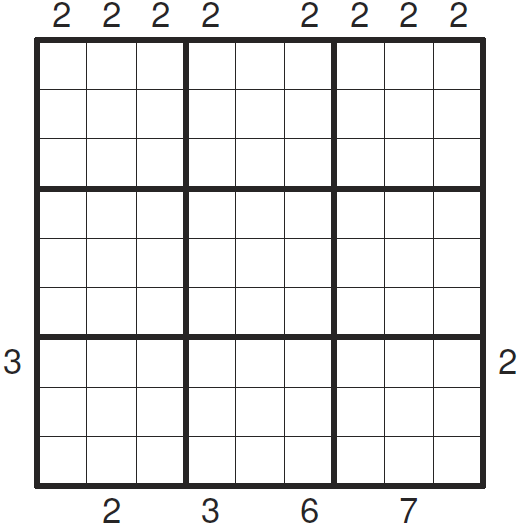 Moreover, there is one continuous loop inside the sudoku grid. All the digits 0, 1, 2, 3 are used as clues for the Loop puzzle (these digits gives the number of cell sides used for loop). And all digits 8 are always inside the loop. Some sides of the loop are marked." I don't think there's a way to make this kind of puzzle fair in a WSC. Even if you make the loop solving part to be very easy, a player that hasn't played loop puzzle before will feel very umcofortable. My argument is that even on a very easy puzzle, a beginner will never be competitive against a specialist. If I follow the reasoning that you made about skyscrapers sudoku, it means you can create a loop sudoku which is, say, 95% about sudoku and 5% about loop. From a puzzle player point of view, this is fine for WSC but from a player who never solved loop puzzles before point of view, the 5% of the puzzle about loop can already be a source of unfairness. I understand that people in the puzzle community could be sad to see players who don't know about other puzzle category than sudoku and they want to encourage them to play a wide range of puzzle types. However I don't think that including a lot of puzzle types in the WSC is the right way to do it. And I think these hybrid puzzles can without any kind of problem be integrated into WPC (finally this is no more than combine 2 WPC puzzle types). From my point of view, these kind of hybrid puzzles should be eliminated or at least minimized in WSC. Do you agree with that? Can I be reassured that the next WSC will contain a negligeable number (and negligeable number of points) of these puzzles? If I refer to past competitions organized by Indian authors, I think I can be reassured, but I hope you understand from the last year discussions that I want to have more guarantees concerning WSC. "While I’ve written a book of Battleship Sudoku, that combines the puzzles Battleship and Sudoku, we can agree that this kind of puzzle – which rewards experience outside of sudoku – is not appropriate at a WSC." I agree with these statements, I hope you too. I hope that starting from 2016 we'll have proper WSC two years in a row. I hope that if I take part in the WSC my ranking will reflect my ability to solve sudokus during the competition. I hope that you understand these are important questions for me, that require clear answers from you as they will potentially have an effect of my participation in the WSC (and please note that my question is more “which category of puzzles will appear in the next WSC” than “which category of puzzles do you think is appropriate at a WSC”, what, I learnt from last year, can lead to different answers). Location: India We agree that the simplicity of the basic rules are the essence of a sudoku and in a World Sudoku Championship all (or almost all) sudokus should follow these basic rules. However at the same time we should not limit the creativity of sudoku creators who can tweak the rules a bit yet retain the essence of a sudoku. Specifically answering the edge cases that you described. · Repetition of digits – All sudokus have non-repeating digits in rows, columns and outlined regions, except one sudoku in a team round where each digit appears twice, and (maybe) one sudoku in an individual round which is a popular variant, like Surplus Sudoku. 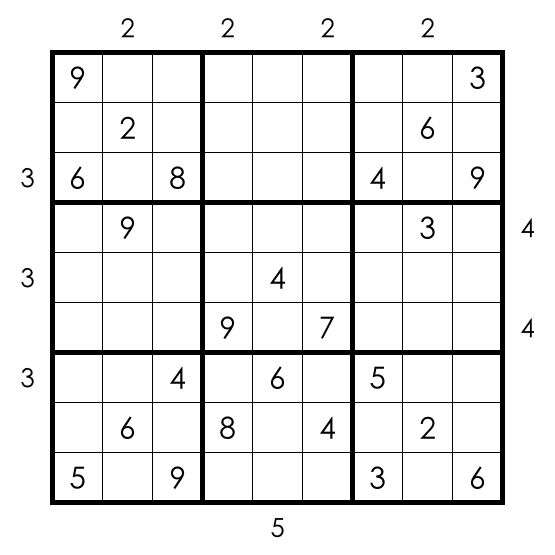 · Outlined regions – In all sudokus the outlined regions cover the entire grid and there is no sudoku with a single cell as a region, except (maybe) one or two popular variants like Scattered Sudoku or Deficit Sudoku. In either case, the number and points of such sudokus is negligible in context of the whole WSC. I think we differ in opinion on the Skyscrapers puzzle not being a hybrid. As an experienced solver with prolonged exposure to Skyscraper Sudokus the variant has become fairly standard, but at the root it is still a hybrid. As to illustrate our point about the influence of the sudoku creator, here are two examples, the first one is like what we described earlier, a sudoku with skyscraper constraints and the second one, a skyscraper puzzle with sudoku constraints. Also to be clear as authors we have decided to not include any hybrid variant which does not naturally fit into a sudoku solving experience. This mean we have avoided hybrids which do not relate to any other sudoku type. Also we have tested the sudokus with test solvers who do not have a puzzle solving background to ensure that there is no bias towards additional puzzle solving skills. We also agree that the loop example shared by you from the LMI test is not suitable for a WSC. Also as per our current estimate of all the sudoku types we expect that such hybrid puzzles (including Skyscrapers Sudoku, Kropki Sudoku, etc.) cover about 4% of the total points in the competition. Overall I am not sure whether these answers would convince you to participate or not, but the answers reflect our thought process as sudoku creators. At LMI we have not been afraid to experiment and in my opinion most experiments have been successful because of the extensive testing / feedback that we collect to ensure that the experiment is well received. We will leave it to your best judgement to trust our experience in ensuring a fair and unbiased competition while allowing for a certain degree of innovation. P.S: Sorry for the delay in the response, the last couple of weeks have been hectic with our efforts to finalize the puzzle booklets for a majority of the rounds. Location: Switzerland Thank you very much for your detailed answer. Location: United Kingdom I've only just seen this thread. On the back of a very lively discussion on my blog between now and this original post, I don't want to kick up any more hornets nests. However, I do want to ask a more philosophical question. In the rules of classic sudoku, placed numbers must appear exactly once in each row, column and 3x3 box. This is sometimes characterised as "non-repetition", so that we might instead insist that placed numbers appear at most once in each row, column and 3x3 box. However, this is not as often characterised as "inclusion" - in other words we require placed numbers to appear at least once in each row, column and 3x3 box. And yet, to my eyes, this is an equally good characterisation of the rules. Why is it that "non-repetition" has more prominence as a sudoku solving concept when compared to that of "inclusion"? I definitely find it curious when people can accept deficit sudoku as bona fide sudoku, and surplus as being somewhat questionable. Perhaps this particular line of thinking sheds some light on the matter. Location: Switzerland Just a few words (I don't plan to be very active on this subject in the future, as I think I've said almost everything I wanted to say in the past few years). In my opinion, both characterisations "non-repetition" and "inclusion" are equally important, and both ARE important. I'm surprised to read that some people make a hierarchy between those, I never heard it before. On a philosophical plan, I don't see any reason to say that a puzzle which hasn't these 2 characteristics is a sudoku. On the other side, if we want to allow these puzzles into sudoku competition, I think we should be more precise about the definition of deficit and surplus sudoku. While I'm not annoyed by "standard" deficit/surplus, I mean deficit having N+1 deficit regions containing each N-1 cells and surplus having N-1 surplus regions containing each N+1 cells (Well, I've to say that I personally prefer when these puzzles are smaller than 9*9). I would be unhappy to see the processus pushed to extreme: I already said it's crucial for me that regions cover the whole grid (or almost the whole grid), I would add that a 9*9 deficit sudoku having 27 deficit regions of 3 cells or 9*9 surplus sudoku having 3 big regions of 27 cells would be far from what I expect a sudoku should be (but isn't contradictory with deficit/surplus definition and doesn't break more characteristic of classic sudoku than "standard" deficit/surplus sudoku, apart from size of regions being far from number of symbols to be placed). Of course, this is again only my personal opinion.